Image Fusion is the process of integrating two or more images from a single modality or multiple modalities. A tumour can be formed either by uncontrolled growth of cells in a particular human organ or due to lesions caused by protracted radiation exposure. The objective of this paper is to implement an innovative image fusion system for the detection of brain tumours. Fusing images obtained from MRI and PET can accurately access the tumour response. In this work, the proposed image fusion technique consists of two major processes such as (I) image enhancement and (II) image fusion both depend on Discrete Wavelet Transform (DWT). Lagrange’s interpolation is used for image enhancement. MRI and PET images are fused based on image enhancement and fusion technique that has been implemented and simulated in MATLAB. The fused image has complement information from both MRI and PET images and the visual quality has improved. The fusion parameters Average Gradient, Discrepancy, PSNR, MSE and Entropy are calculated and the results show the effectiveness of fusion based on DWT. This work can be extended to diagnose any type of abnormalities in all human organs. Brain tumour, Medical image fusion, MRI, PET, Discrete wavelet transform, Image enhancement. In modern medicines and health care, computer assisted diagnoses and therapy strongly depend on image processing methods. Medical images are displayed on the screen to the medical professionals for diagnosing diseases. Imaging in Medical field helps the doctors to see the interior portions of the body for easy diagnosis and make keyhole surgeries for reaching the interior parts without really opening too much of the body. The human body contains many curvilinear structures, the visualization is crucial for planning and navigating the interventional therapies and biopsies. Nowadays, most of the physicians face the problem of diagnosing and directing the patients with a single image solution. This scenario arises when they have to diagnose the disease with more than one modality. This constraint can be bridled by integrating the images from two complementary modalities. Fusion, compression and physical quantity derivation are computational methods required in several computer assisted therapies. For accurate diagnoses, radiologists must integrate information from multiple images of a patient. Multiple images are registered in different formats and are overlaid or combined to provide additional information. The image fusion techniques, find application in medical imaging. The fused image should have complete information and the advantages of medical images should be highly reliable [1-3]. Multiresolution analysis is possible in both time domain and frequency domain by Discrete Wavelet Transform (DWT). The multiresolution analysis finds application in image compression , watermarking , edge detection , image enhancement , and image fusion . The discrete wavelet transform has become a very useful tool for fusion. Fusion techniques provide spatial registration of 2-D surface. To improve pathology identification and clinical diagnosis, the physician requires the fusion of functional image data and anatomical image data acquired from an organ with imaging systems of different modalities to provide composite image . Brain imaging is a subfield of medical image processing deals with the functions and metabolism taken from the brain. Brain imaging is the pathological procedure used to diagnose and examine the medical images in a more effective, accurate and efficient manner. Fusion of the overall brain can be initially accomplished by fusing the skull, ventricular volume as well as the subarachnoid volume between images of the patient’s brain and other brain images or a common image or atlas framework. Identifiable land marks, in the brain can be applied to the coarse fusion to further compensate and adjust for other distortions that may have occurred. The methods can be applied to preoperative and post-operative imaging to enable more accurate comparisons between images and account for anatomical deformations that may have occurred, due to the respective procedures or other patient conditions like trauma, lesions or other abnormalities. The fusion of atlases with brain images for patients that have undergone surgical procedures or experience deformations in cranial and intracranial structures. A tumour is formed either by uncontrolled growth of cells in a particular human organ or due to lesions caused by prolonged radiation exposure. Early detection of disease and malignant tissue can lead to a better diagnosis. The development of noninvasive methods for detection and of tumours has great importance in modern medicine. Magnetic resonance imaging (MRI) is a non-invasive method that uses powerful magnetic field radio frequency pulses and a computer to produce detailed picture of organs, soft tissues, bone and virtually all other internal body structures that can help physicians to diagnose and treat medical conditions. MRI does not use harmful ionizing radiation and so it is more popular among patients. In brain MRI, a tumour can appear darker or brighter than normal tissues, or even as the same intensity as normal tissue. Within one slice of a tumour different regions can have different appearance. In some cases, tumours look similar to the surrounding normal tissue because large intensity overlaps between the tumour and the background. The PET measures the functional feature of the examination, typically the amount of metabolic activity. PET scanning is also used to evaluate the grade of tumour. The Positron Emission Tomography (PET) scan is a suitable tool for patient monitoring and early assessment of tumour in oncology. 2’- deoxy-2’-[18F]-fluoro-D-glucose (FDG) is the most widely used tracer in clinical purpose. Glucose consumption with the FDG of tumour cell may not be sufficient to access the therapy. The features of cancer metabolism like proliferation, hypoxia and apoptosis may improve the assessment of tumour. 3'-[18F]- fluoro-3'-deoxythymidine (FLT) is a proliferation tracer providing earlier and more specific information than FDG. 18- Fluoromisonidazole (FMISO) tracer can identify tumours resistant to therapy, especially radiotherapy . Different physicians might prefer to analyse images in different manners, depending on their experience and personal preferences. The detection and diagnosis of cancer has several essential elements: a non-fat-saturated Tl-Weighted pulse sequence, a fat-saturated T2-Weighted pulse sequence, and a set of contrast-enhanced pulse sequences at different phases to obtain identically acquired pre-contrast and multiple postcontrast views provide MR image datasets. In some situation fusion of time-separated images arises. It may be useful to fuse an image taken during one patient examination with an image taken in a different examination. Fusing images obtained with MRI and PET can accurately access the tumour response. The medical images acquired have imperfections due to low resolution, high level of noise, low contrast, geometric deformation and imaging artefacts. The imperfection in medical images is a major issue in medical field. It has serious impinge over patients that may cause faulty diagnosis or path planning during surgery. The purpose of enhancement is to analyse the brain images accurately to facilitate effective diagnosis the brain related diseases and problems. Image enhancement is the pre-processing tool for further image processing steps, quantitative actions can decide which methods are mainly suitable and optimal. The purpose of image enhancement is to improve the visual clarity of the image and provide better transform representation for future automated image processing like analysis, detection, segmentation and recognition. The comparison of different brain imaging techniques with respect to their applications, limitations and advantages are presented . 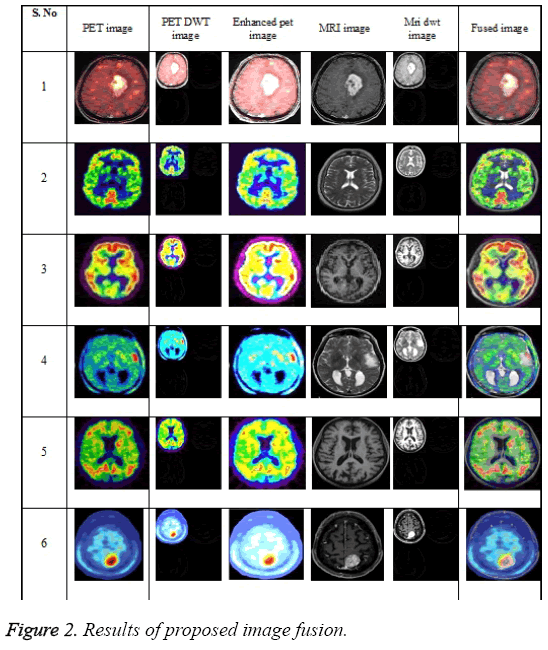 In this paper the PET brain image is combined with Magnetic Resonance Image (MRI), which is rich in spatial resolution in order to diagnosis brain tumours. The proposed image fusion technique consists of two major processes such as (I) image enhancement and (II) image fusion, both depend on wavelet transformation. The Positron Emission Tomography (PET) has a low spatial resolution; hence the PET image is enhanced before fusing the PET image with MRI image. After enhancing, the resulting image will have high spectral and spatial resolution than the conventional image fusion, which will help the physician in all aspects for diagnosing the tumour cells. A little progress in the resolution of the resulting medical image will be a great achievement. Image enhancement can be broadly classified into two categories, namely spatial domain enhancement and frequency domain enhancement. Spatial domain enhancement operates on pixels, thus provides adequate robustness and imperceptibility requirements. Frequency domain image enhancement operates directly on the transform coefficients of the image. Interpolation finds application in spatial domain enhancement. Many interpolation techniques were explained . The Lagranges interpolation technique is proposed for image enhancement since it has edge preserving capability as compared with Bicubic interpolation . The Proposed image fusion method is shown in Figure 1. The input low resolution multispectral image (i.e. PET) is separated into the sub-bands such as HL, LH, LL and HH by discrete wavelet transform. Figure 1: Proposed image fusion method. The first low-pass sub-band having the coarse approximation of the source image called LL sub-band, and three high pass sub-bands that develop image details transversely in different directions-HL for horizontal, LH for vertical and HH for diagonal information. The Lagranges interpolation is applied to all four bands. The difference between the image from sub-band LL and the input PET image is computed and the Lagrange interpolation is performed in the LL sub-band image, thus the lower resolution image is enhanced. The computed difference image is then added to the images in sub-bands HL, LH, HH. The enhanced PET image (i.e. high resolution image) is achieved by taking the inverse DWT of input images, HL images, LH images and HH images as shown in Figure 1. The Discrete Wavelet Transform (DWT) will decompose the enhanced PET and MRI image to obtain the decomposed coefficients. The decomposed coefficients are combined in the wavelet domain based on the fusion rule. The fused image is achieved by taking the inverse DWT on fused coefficients. The resultant fused image visually displays a combination of image features from the MRI image dataset and image features from the PET image dataset. The Intensity Hue Saturation (IHS) and Principal Component Analysis (PCA) based image fusion has large spectral distortion as compared with the proposed method . 5. Add the difference image with sub-bands HL, LH, HH. 10. Take inverse DWT on fused coefficients. The proposed method of image fusion is implemented and simulated using MATLAB. The low resolution PET image is enhanced by Lagrange’s interpolation technique to improve the resolution and preserves the edges. The DWT is applied on enhanced PET image and MRI image. Both the images were fused by proposed method. The resultant fused image has integrated features of MRI and PET. The medical image fusion evaluation methods are subjective evaluation and objective evaluation. Subjective evaluation is also called visual evaluation, by naked eye directly to the quality of the fused images [15,16]. Images are taken from online database . Figure 2 shows the results of proposed image fusion. Figure 2: Results of proposed image fusion. The fusion parameters average gradient, discrepancy, PSNR, MSE and entropy are calculated by objective evaluation. The spatial quality and the spectral quality are verified by average gradient and discrepancy Equations 1 & 2 respectively. High average gradient and less discrepancy leads to high quality. An improvement in the PSNR value will increase the visual appearance of the image Equation 3. The mean square error (MSE) is a measure of spectral fidelity between each unsharpened MS band and corresponding sharpened band Equation 4. Where, is the number of bits per pixel in the image, R is the reference image, F is the fused image, M is the width of the fused image and N is the height of the fused image. Entropy is the amount of information get from the fused image Equation 5. The fusion performance has been improved for higher values of entropy. Where p(l) is the probability of gray level l and the dynamic range of the analysed image is [0, L-1] (typically L=256). Table 1 gives the fusion parameters; the proposed method achieves high average gradient and very low discrepancy that implies high spatial resolution and high spectral resolution. Higher PSNR valves and low MSE values achieved by the proposed system reflects the quality of reconstructed image has improved. The performance of information got from the image is proved by entropy. The better quality of the image is improved visually and quantitatively which helps the physicians to detect the brain tumour and also assist during intervention. This paper deals with Detection of Brain Tumour using Discrete Wavelet Transform based Medical Image Fusion for the diagnosis and better treatment. Image Fusion is the process of integrating two or more images from a single modality or multiple modalities. In this work, DWT based image enhancement and fusion technique has been implemented. The proposed image fusion technique consists of two major processes such as (I) image enhancement and (II) image fusion both depend on wavelet transform. Lagrange’s interpolation is used for image enhancement. MRI and PET images were fused by the proposed method. The fused image has complement information from both MRI and PET images and the visual quality has improved. The fusion parameter Average Gradient, Discrepancy, PSNR, MSE and Entropy were calculated and the results show the effectiveness of fusion based on DWT. The proposed method can be used to detect all kind of brain tumours. This work can be extended to diagnose any type of abnormalities in all human organs. Wang HH. A new multiwavelet-based approach to image fusion. J Math Imag Vis 2004; 21: 177-192. Petrovic V,Xydeas C.Evaluation of image fusion performance with visible differences. Lecture notes in Computer Science 2004. Pajares G, Dela Cruz JM.A wavelet-based image fusion tutorial.Pattern Recogn 2004;37: 1855-1872. Asghari MH, Jalali B.Discrete Anamorphic Transform for Image Compression. Signal Processing Letters IEEE 2014; 21: 829-833. Sha Wang, Dong Z, Jiying Z, Tam WJ, Speranza F.Adaptive watermarking and tree structure based image quality estimation, multimedia, IEEE Trans 2014; 16: 311-325. Zhenjun T, Yumin D, Xianquan Z, Liyan H, Fan Yang.Robust image hashing via colour vector angles and discrete wavelet transform. Image Processing 2014; 8: 142-149. Atta R, Ghanbari M.Low-contrast satellite images enhancement using discrete cosine transform pyramid and singular value decomposition. Image Processing 2013; 7: 472-483. Huihui S, Bo H, Qingshan L, Kaihua Z.Improving the Spatial Resolution of Landsat TM/ETM+ Through Fusion With SPOT5 Images via Learning-Based Super-Resolution, Geoscience and Remote Sensing. IEEE Trans 2015; 53: 1195-1204. Sarah RH, Gopal B, Avinash. 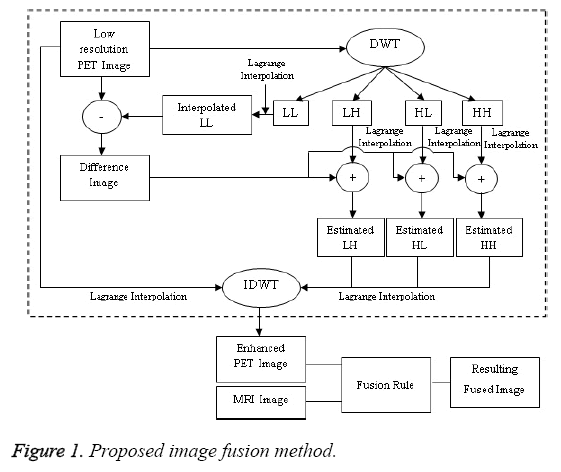 Method and Apparatus of Multi-Modality Image Fusion, U S P ApplPubl 2005. David S, HattN,Boussion P, Allard M, Barrett O, Visvikis D. Multi-tracer PET image fusion using fuzzy theory: a feasibility study, IEEE Nuclear Science Symposium Conference Record 2009; 3726-3730. Mussarat Y, Muhammad S, Saleha M, Mudassar R, SajjadM. Brain Image Enhancement - A Survey. W ApplSci J 2012; 17: 1192-1204. Thomas ML, Claudia G, Klaus S. Survey: Interpolation Methods in Medical Image Processing, IEEE Trans Med Imaging 1999; 18: 1049-1075. Zhou J,Civco DL, Silander JL. A wavelet transform method to merge Landsat TM and SPOT panchromatic data.Int J Remote Sens 1998; 19: 743-757. Choi MJ, Lee DH, Lim HS.Framelet-Based Multiresolution Image Fusion with an Improved Intensity-Hue-Saturation Transform, The International Archives of the Photogrammetry, Rem Sens Spat InfoSci 2008. Guohua Z. Wavelet analysis and basic application Science Press2006. Zhoucheng Li. Wavelet analysis and application. Electronic industry press 2003. JuhaszC, DwivediS, KamsonDO, Sharon K. Michelhaugh, and Sandeep M. Comparison of Amino Acid Positron Emission Tomographic Radiotracers for Molecular Imaging of Primary and Metastatic Brain Tumors. Mol Imaging 2014; 131-136.